Different forms of room acoustic treatments and creative designs are vital when creating spaces with a difference. MACH Acoustics were requested by Allies and Morrison to review the acoustics of their offices and reception spaces. 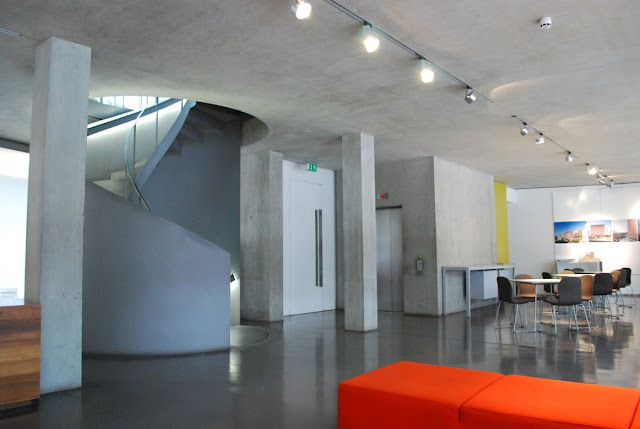 For those who have seen these spaces it is clear that conventional forms of soft treatment would clash with the hard, minimalist feel of this building. This report illustrates a respect for architecture and the exceptional beauty of this building. The proposed forms of treatment are seen to compliment the concrete and details of this building. To provide design flexibility, two design options where proposed; the first was to apply acoustic treatment in small quantities to a range of objects, including cupboards, display cabinets and other small elements. The second option was to add soft treatment to one or two areas, where these areas had a sufficient surface area. The second half of this report provides a range of visuals to help the design team understand MACH Acoustics concepts.